Website visitor John H. requested this article on the OQ-2A drone from the March 1971 edition of AAM. The OQ-2A was produced by the Radioplane Company, of California at the beginning of World War II. Reginald Denny, a famous actor of the time and owner of the company, was an avid radio-control flyer. Rudder and elevator control was provided via remote-controlled electric servomechanisms. 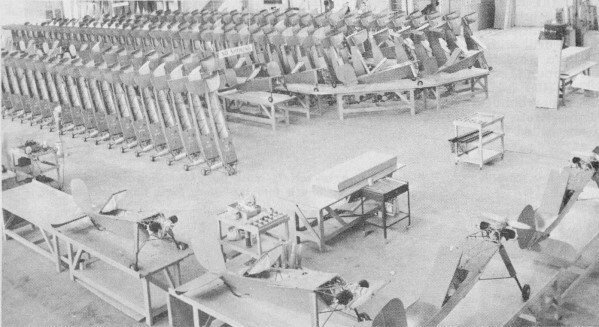 Norma Jeane Mortenson, aka Marilyn Monroe, worked on building these planes in the Radioplane Company's shop. Thousands of these small radio-controlled planes were built for the Armed Services by a California manufacturer. The OQ-2A was catapult-launched, but it had landing gear which primarily served to cushion the shock of the drone's landing by parachute. Before Dee Bee and Lanier, there was a ready-to-fly radio-control model-plane factory! Strut-supported wings have symmetrical airfoil so that they are interchangeable, not aerobatic. Earlier versions had a single propeller and some thrust offset. Note equipment locations. Simultaneous-firing 6-hp twin-cylinder engine drives spur-geared counter-rotating propellers. On the dry lakes of California's Mojave Desert, Northrop-Ventura (then known as Radioplane Company) began, in June 1941, prototype tests on a target drone with a twelve-foot wingspan. 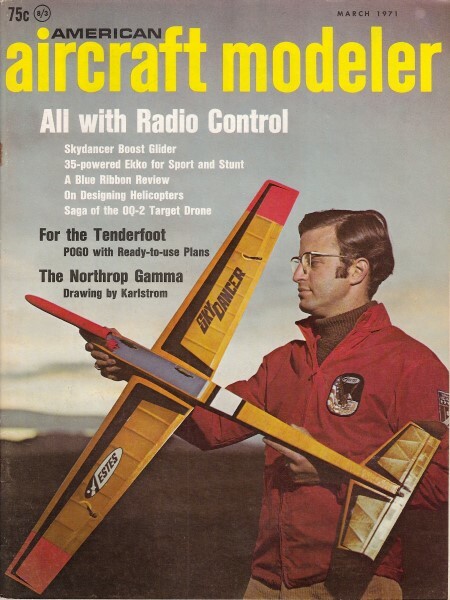 By 1945, the firm was producing forty of these small radio-controlled planes per day for the Armed Services. Primarily, these drones were used to train antiaircraft ground defense units which were using sub-caliber automatic weapons up to and including 40 mm cannons. Flying at a top speed of 88 mph, the small radio-controlled drone had relatively the same size and speed characteristics at 200-yards range as did a normal-sized World War II fighter plane at 500 yards distance. The rugged little plane duplicated actual attack conditions and was easily maneuvered through practically all flight attitudes over any type of terrain. Incorporated in the drone was a 24-foot parachute, which could be released either by the transmitter operator or automatically when hits were scored on the airborne radio unit. This permitted salvage of the target and provided verification of the gunnery crew's marksmanship. The target also could be, and often was, landed by remote control "dead stick" when sufficient landing area was available. 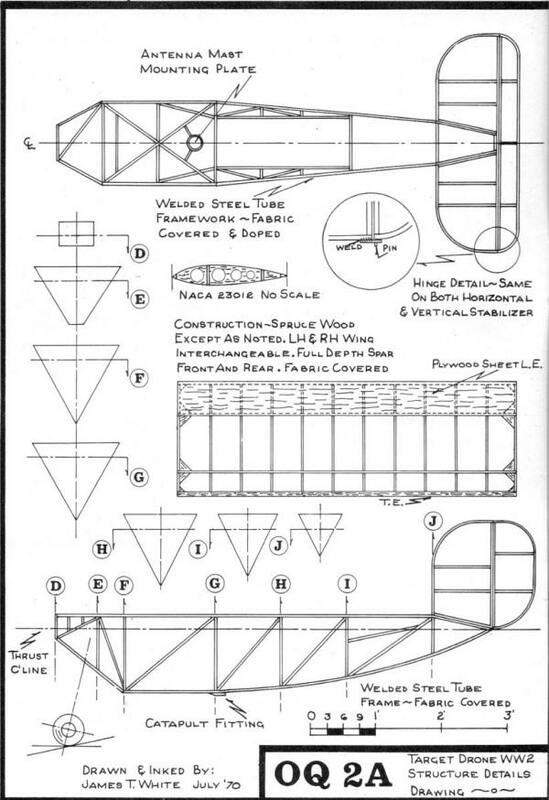 Although the target drone was designed, developed, and manufactured by Northrop-Ventura (Radioplane Co.), the Frankfort Sailplane Co. (Joliet, Ill.) also was awarded contracts to produce the bird for the armed services. Its radio transmitting equipment was manufactured for Northrop-Ventura by the Doolittle Radio Co. (Chicago, Ill.), the radio receiving equipment by Bendix Aviation (North Hollywood, Calif.), and the servo unit by Hansen Mfg. Co. (Princeton, Ind.). The catapult unit was supplied by Montpelier Mfg. Co. (Montpelier, O.). One of the most popular of the family of drones produced by Northrop Ventura was the OQ-2A (U.S. Navy Model TDD-1) radio-controlled target. The vehicle was powered by a two-cylinder air-cooled engine which developed 6 hp at 3800 rpm. The horizontally opposed engine was a two-cycle simultaneous firing type. Two concentrically shafted contrarotating propellers pushed the drone to a speed simulating that of actual fighter planes. The engine incorporated a two-throw type crankcase supported on three bearings. The rear main bearing was a bronze sleeve. The forward main, a ball-bearing type, was of sufficient size to carry both radial loads and front propeller thrust. The extreme front end of the shaft was supported by a pair of ball bearings which were inside the aft propeller hub. The bearings, piston and cylinder walls were lubricated by mixing the lubrication oil with the fuel. The proportion was eight parts fuel to one part lube oil. Engines were equipped with a centrifugally-operated spark advance mechanism, while earlier models had a manually-operated spark advance control timer. The fuel system was operated by pressure developed in the engine crankcase. A small check valve furnished the 2 psi pressure required to operate the system and the pressure was transmitted from the crankcase to the fuel tank by a neoprene hose. Total fuel carried by the drone was 1.8 gal., which gave the bird a total of one hour's flight time. The ignition system was a battery-coil-condenser type. An ignition battery of 6V was sufficient to start the engine and normally had a useful life of approximately one hour. Spur gearing provided the counter-rotating drive for the rear propeller. The drive operated from a gear mounted on the crankshaft just forward of the front main bearing. This gear drove two counter-gears, the second of which meshed with the propeller drive gear mounted on the rear propeller hub. The hub was guided by the crankshaft on the inside and supported by a ball bearing on the outside. The front propeller was driven by the engine crankshaft. The gear train was lubricated with SAE 70 oil contained within the gear housing. The drone was launched by a 36-ft. catapult powered by a rubber shock-cord system. This method permitted operation from small restricted areas, which often resembled actual combat terrain. The fuselage was an extremely rugged structure of welded steel tubing, covered by doped muslin cloth fabric. The fuselage cross section was triangular. 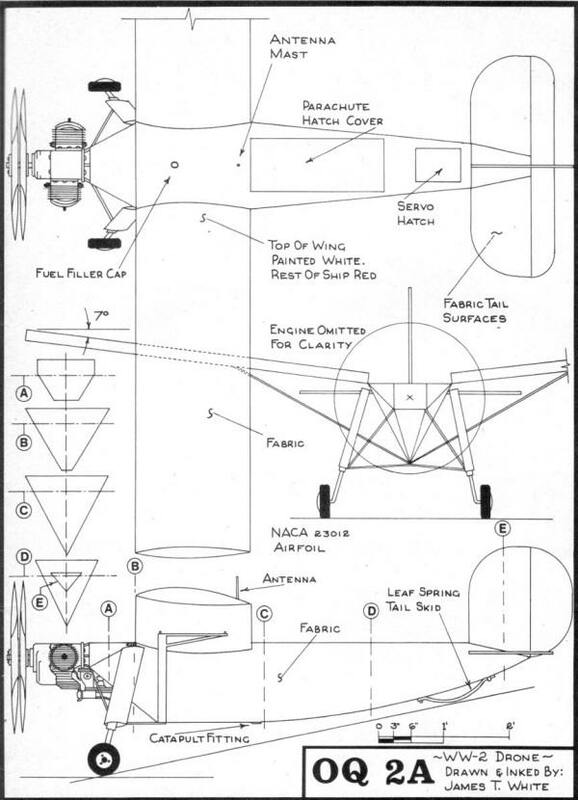 The larger of two openings along the fuselage top surface provided for the parachute installation; the rear hatch gave access to the servo control unit and stabilizer mounts. Wing on the OQ-2A target were interchangeable and could be used for either right or left hand installation. Constructed of spruce, they were fabric-covered and used two full-depth spars, with the rib in three sections. Each wing contained twelve ribs. The end ones were solid; lightening holes in ten inside ribs made for a slight weight reduction. Thin plywood covered the top and bottom leading edges back to the front spar. 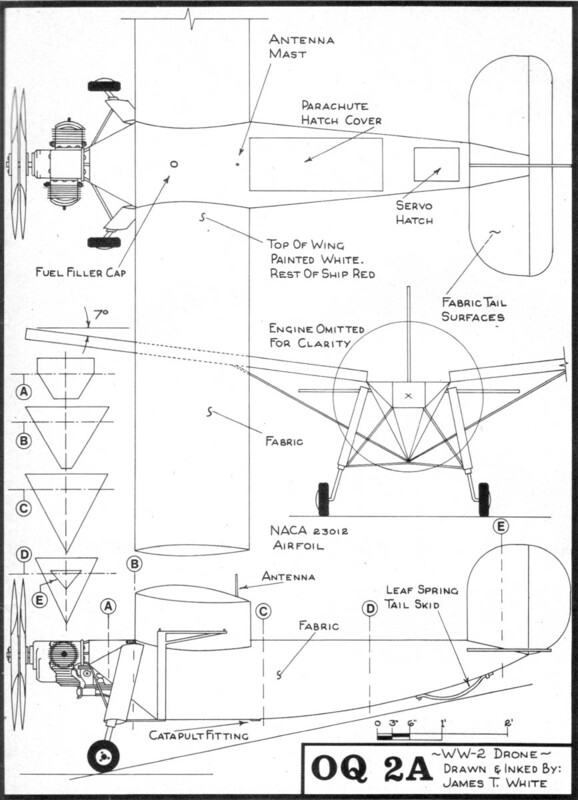 The airfoil utilized was the NACA 23012 section. Each wing was supported by a single streamlined steel tubing strut. Trim adjustments were made by means of an adjusting screw where the strut attached to the wing's lower surface. The fabric-covered tail surfaces also were fabricated of steel tubing framework. These surfaces were flat, since no airfoil section was required for good flight characteristics. Horizontal and vertical stabilizers were identical and interchangeable. Conventional elevator and rudder, in keeping with the manufacturer's design and fabrication methods, were the only means used to control the target in flight. The target's basic system of radio-control was an ultrahigh frequency carrier of 73 megacycles modulated by five different audio frequencies. Four of the audio frequency tones were used for the drone's four flight attitudes: right, left, up, and down. The fifth frequency was used to release the parachute, which in turn operated a manual shutoff system for the engine. The fifth frequency was operated by a button-type switch, whereas the other four frequencies utilized a control stick to simulate normal aircraft control. Power for the radio was provided by the battery box unit mounted in a channel-type tray in the fuselage. The unit could be shifted both fore and aft, thereby balancing the ship for proper flight attitude. The servo unit was activated by the receiver, thus providing mechanical action necessary to control the rudder and elevator. Two 6V motors with reversible fields provided action to the gear trains which gave the leverage required for flight control. A single package servo unit was located just forward of the horizontal stabilizer and was accessible through the fuselage top. The 24-foot circular canopy parachute was of standard design. The recovery system also was provided with a standard-type pilot parachute. A single cable extended from a D ring and was attached by a shackle to an apex of four riser cables, which in turn were fastened to four points on top of the fuselage. The entire target drone was fabric-covered with 80-thread muslin cloth and was dope treated in two colors. The top of the wings was white, the rest of the ship was red. This two-color combination provided a visible means of telling the difference between the top and bottom of the plane during flight. 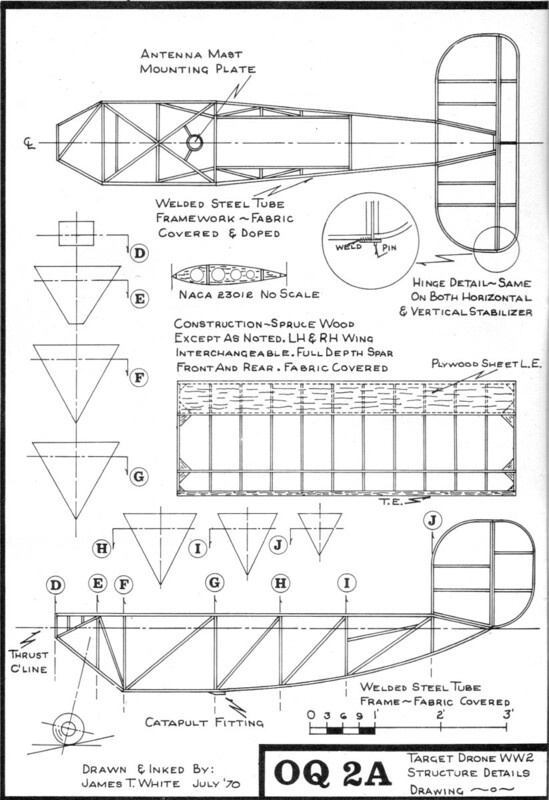 An interesting fabrication sidelight: the wing fabric covering was manufactured as a sock, which was later slipped onto the wing structure and doped. Much of the testing of the drone was done on the dry lakes of the Mojave Desert. A stripped-down Packard auto­mobile sometimes was used as a test platform. The test plane was mounted on a steel platform structure added to the auto's front section. As the auto approached the drone's flight speed, the designers could observe the target's flight characteristics without fear of actual flight damage. In operation, the drones were flown by men from various branches of the services. They were trained by and under the sponsorship of Northrop-Ventura. This policy of training Armed Services personnel to fly the various drones was continued late into the 1950's and early 1960's. Such were some of the early stages in the beginning of radio-controlled flight. Of the thousands of OQ-2A drones fabricated, only one is now known to exist and that one is carefully preserved by the Northrop Corporation. 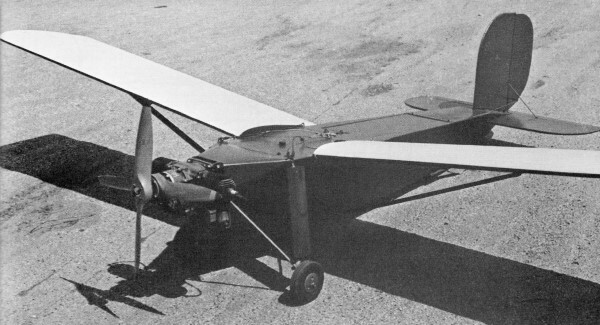 The OQ-2A drone was phased out near the end of World War II. Northrop-Ventura's early pioneering with pilot-less drones help the firm to develop and produce later birds in vast quantities - notably the OQ-19 and KD2R5 drones. Author's Note: "As with many old-line airplane firms, Northrop-Ventura's past is often clouded with this, that, and other things. One thing the firm never did care to discuss was the fact that Radioplane was originally founded by Reginald Denny, the old-time movie actor and long-time modeler. Once the firm began to move along, his activity with Radioplane became less and less. "In the 1950's, radio equipment was supplied to Radioplane by Babcock Engineering, but Babcock was sort of a spring-off from the main firm. It was headed up by the late Ferris Smith, who also was a Vice President of Engineering at Radioplane. The same type of thing occurred with the servo units and other equipment too. It became very involved and difficult to understand. The president of Radioplane, the late Whitney Collins, became the President of Northrop Corporation when Northrop bought out Radioplane. The name of the company was then changed to Northrop- Ventura. "I also believe that Mr. Fox (Fox Mfg. Co., Fort Smith, Ark.) was with the company during its early days, but I wouldn't swear to it. "I do know Marilyn Monroe (the late actress) worked in the wing section during the war. Her career began with some still photos taken while she was employed by Radioplane.